This new exhibition records a decade when the population grew by 30%, housing estates spread out to the west and south of the town, and Maidonians still drank Nicholsons beer and shopped at Webbers department store. There is a chance to share your memories of the decade that saw the birth of rock and roll – even if you did not live in Maidenhead at the time. The exhibition will include sections on the Vanwall racing car and the Fairey Rotodyne, both projects closely associated with Maidenhead. 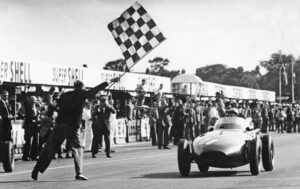 60 years ago Stirling Moss drove the Vanwall to victory in the British Grand Prix at Aintree – the first time a British driver won the British GP driving a British car. But in 1950 Maidenhead Magistrates had charged him with driving without due care and attention! In November 1957, the revolutionary Fairey Rotodyne (the world’s first vertical take-off airliner) made its maiden flight from White Waltham airfield. Duration: 28th June to 21st October 2017.